We have a good community with a decent size. 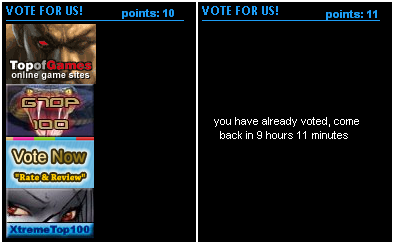 There are usually around 20 players online, yet not many seem to be voting. Maybe they forget, maybe they're just don't care, who knows. 1) We've been told in the past that if we manage to be number one on the charts, we'll get double the exp during weekends. This is great, in fact, it's one of the things that gets me to vote whenever I'm feeling lazy. Apparently nobody seems to know about this double exp thing (players would probably vote if they; who doesn't like double rates?) So maybe this should be advertised more. Like maybe put it so that one sees the message when they log in? 2) Another thing that would get more players to vote would be doing a voting point system. The voting point system is used by many successful RO1 servers, and it pretty much guarantees that more players will vote. With the vote point system, you get points every time you vote, and can exchange those points for items (these items are usually rare and hard/impossible to get in game) once you have a certain amount of points. The vote-point system requires a user to earn a HIGH amount of points to prevent the items gained from becoming too common. For example, you gain 100 points (the equivalent of 50 days of voting) and exchange them for a lvl.80 armor. i will work on it, thanks leni! I could give you the name of some servers that use this so you know how they work.